Now run the project, hope you will get paging enabled gridview. 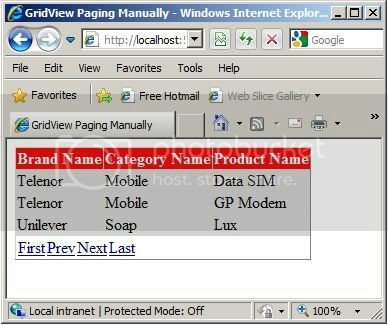 Note: Gridview control gives us PagerSettings tag to enrich look & feel for paging navigation. By using this PagerSettings tag you can navigate from one page to another by image or text instead of default number. 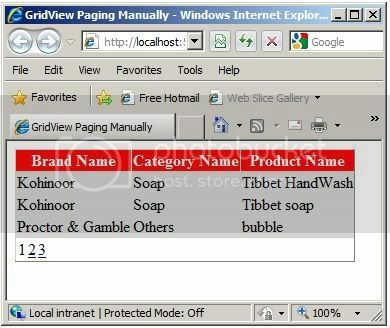 To use images as your navigation just use FirstPageImageUrl, LastPageImageUrl, NextPageImageUrl, PreviousPageImageUrl properties. Keep experimenting on PagerSettings tag to give the user different look and feel. Later i will discuss on efficient paging. Until then TC. The article is excellent. Thank you. I suppose this is client side paging. But, what we can do to make server side paging with DataTable work? Thanks a lot man. i was using a sqldatasource at first, then wanted to use code to bind the data. And i thought paging it will be very tough; but you have shown it in so few easy steps.